While live performances are undoubtedly their forte (having performed in venues large and small, not to mention numerous stadia, a royal palace and a Millenium Dome!) – when their renditions captivate and mesmerise audiences – SHAAM have, due to public demand, released albums in the past, though only in the UK. These were Mystic Call (1997), Baade Sabah (1997), Our Children Our Future (1998), Revelations (1999), and Marhaban Ya Ramadan (2000). Since the last of these albums two years ago, SHAAM have focused their considerable talents on their live performances and on developing new songs and styles that reflect their ability to be able to sing in a number of languages including English, Arabic and Urdu. They have sought to develop their material in a way that appeals to all ages and is reflective of them as artists who are British Muslims – artists who straddle two cultures and have an understanding of both. 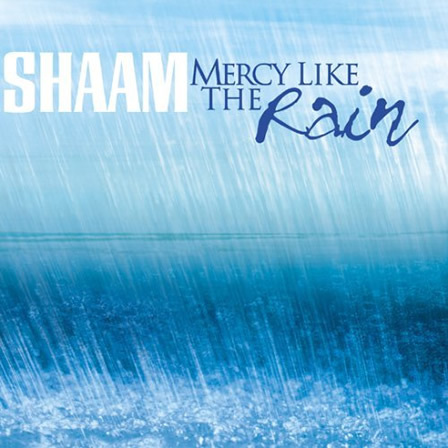 In the spring of 2002 SHAAM signed to the nascent record label Meem Music founded by Tayyeb Shah, former Managing Director of Yusuf Islam’s Mountain of Light and so work began on Mercy like the Rain. The aim was to produce an album that would primarily appeal to all sections of British Muslim society; that would introduce classic nasheeds – performed in a contemporary fashion but adhering to the Islamic voice-and-percussion tradition – to a new generation. To this end it was agreed that non-English tracks would be translated and the lyrics of all songs incorporated into the album artwork as well as this website, to allow for greater comprehension and appreciation of their richness. Mercy like the Rain has only 6 tracks but the average length of a song is nearly 6 minutes! Traditionally Arabic nasheeds have never been short 3 minute affairs as we have become accustomed to in the West. Rather they easily span 10 minutes plus. So one of the first tasks for the group was to find ways of reducing the duration of the chosen nasheed without sacrificing too much content or the accompanying artistic improvisation. Once that was resolved, arrangement and melodies were either adapted from the traditional or devised afresh. In all 10 songs were developed and halfway through the project the final six were selected: one Urdu, two English and three Arabic nasheeds got the proverbial nod. For the Urdu track, Jashne Aamede Rasool, selection was easy – it was simply one of the most requested songs during their live shows and a classic in the Indian sub-continent and its diaspora in the West. However, for the album it was decided to give it a contemporary flavour by adding drums to what is traditionally an a cappella track and some extemporising by Haroon. The title track Mercy like the Rain is one that seeks to list some of the many mercies bestowed upon mankind by Allah. Its words are strikingly simple – designed to be easily sung by the young – and yet the song reflects deep meaning about our view of this world. Thank you Allah, the second English track, is much more explicit in its praise of the Creator and is another established crowd pleaser. When it came to developing a melody for this song, Haroon and Alpay together crafted something reminiscent of the Malaysian style – their salute to the contribution made to the nasheed genre by the likes of Raihan. The choice of Mowlaya Sali was almost mandatory given the resurgence of interest in the West of Imam al-Busiri’s classic Qasidah Burda, or Poem of the Mantle. The track is ingenius in that it takes only a few well-chosen verses from chapter 10 but uses them to form the basis of a variety of singing styles, sometimes fast yet mainly slow, that really do showcase SHAAM’s vocal talents. Its style is Syrian. The remaining two Arabic tracks. Qulama Nadayt Yahu and Ana Dayfak are both rousing nasheeds to say the least, each with its distinctive drum patterns. The latter, a re-work of a version they released in 1998, features the distinctive voice of young Abdul-Aziz, now with the boy group Al-Habaib (who hope to release their debut album next year), while the former is presented in its fastest style of rendition. There are at least four other styles of singing Qulama Nadayt Yahu (originating from different parts of the Muslim world), each progressively slower and with a different melody – all of which SHAAM are capable of performing. This version has a fantastic intricate opening that whets the listener’s appetite for the main body of the song. It is this opening that starts the album and introduces us to the world of SHAAM. SHAAM would like to thank Allah Most High, Lord of the Worlds, the Most Merciful; peace & blessings upon his most exalted Messenger, master & seal of the prophets of Allah, Muhammad & upon his family and companions. May Allah’s peace & blessing be upon them all. Our families [thank you for your endless love, support & understanding]; Shaykh Salih al-Hamawi, Shaykh Hussein Ali al-Rabbani, for their continued support, encouragement guidance & prayers; Shaykh Habib Ali al-Jifri; Tayyeb Shah for his endless efforts in helping to promote the traditional art of Nasheeds & helping us to carry our mission forward; Shahid Alam; Anjum Bashir; Yusuf & Ahmad Muzarze, Tom Lowry, Darren Wood [congratulations on the wedding], Jon Cotton, Neil Spragg and Ahmet & Mustafa Karaduman; Dr Muhammad Sultan & Yasrab Shah for the translations of the lyrics; Ergin Mahmout for making things happen in Istanbul; Yilmaz Balcin, Yusuf Alpaydin, Mustafa Özturk & all the guys at the Bosphorus hostel; Ömer Gokalp & all at Asir Ajans; Andrew Sparkes; Mike Brown; Firdous Zahoor; Zahoor Ahmed; Osama Osman, Zain Bhikha, Majid Hussain, Khaleel Muhammad, Najeeb Bateman & Al-Ameen Bedr; Yusuf Islam for his valued advice; Dawud Wharnsby Ali for his understanding & Suhel Miah; Waleed Saeed; Dr Hani al-Banna, Aflak Suleman, Yusuf Kasujee & Shaheda Dewan of Islamic Relief; and finally all the brothers & sisters who have invited us to their functions & conferences enabling us to benefit the Ummah. This album is dedicated to the memory of Daniel Amar – a dear friend who, as fate would have it, was the first to listen to the completed album a few days before he passed away. May Allah swt grant him Jannat al-Firdaws (Ameen).